Takada Castle (高田城) is the ruins of castle located Joetsu, NIigata. 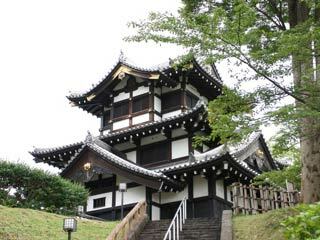 It was built in 1614 by Matsudaira Tadateru, the 6th son of Ieyasu. There is moat and reconstructed Yagura, three stories keep, today. It is also famous for Yo-Sakura, the night Sakura. Takada Castle was a large-scale castle with 750,000 goku of early modern times which was built by Matsudaira Tadateru, 6th son of Ieyasu mainly in Bodaiga-hara of Takada in 1614. Honmaru was enclosed by an inner moat and a base. At present, its width is 40-50m, average water depth is about 5m, the height of base is 10m or so and the whole length is about 1,000m, which is an enclosing ground base including2 Uchi-masugatamon, or 2 inner box style gates and 1 inner key style gate. The current keep of Takada Castle was reconstructed on the grounds of the south-east rim of Honmaru, or the central part of the castle This had been called "Gosankai Yagura" or Three stories Keep symbolizing the castle instead of "Tenshukaku" or a the 19th year of the Meiji era.